Rolled mesh is compact and sold in lengths of up to 150 feet. Flat sheets are better for smaller projects when storage is not a concern. 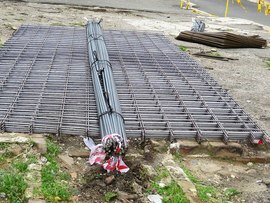 Rolled reinforcing mesh runs from $0.14 to $0.33 per sq. ft. Flat reinforcing mesh is slightly more expensive at $0.25 to $0.50 per sq. ft.